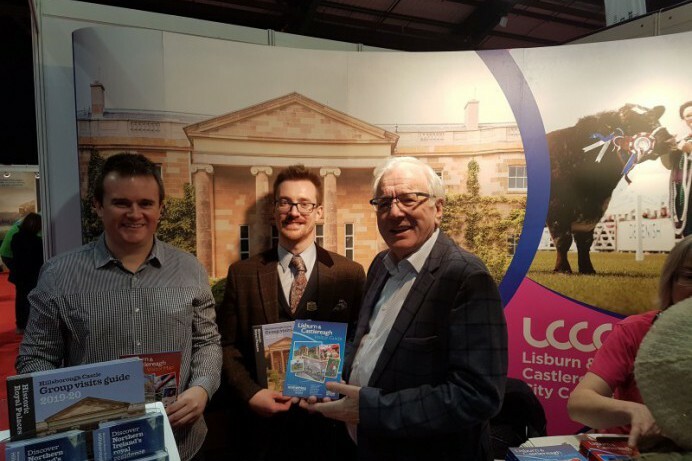 Lisburn & Castlereagh City Council had its own stand at the 2019 Holiday World Show in Dublin within the Northern Ireland Tourism Village area. Historic Royal Palaces (HRP) and two accommodation providers joined the Council on its exhibition stand. The Council was showcasing what the tourism opportunities the Lisburn Castlereagh area has to offer in terms of its many attractions, sights, eateries, shopping and accommodation. It held a competition which was open to everyone who visited its stand to win a package including an overnight stay in the area along with dinner and a tour of Hillsborough Castle, as well as a selection of family prizes: Dundonald International Ice Bowl, Streamvale Farm and Lagan Valley LeisurePlex. Around 40,000 people made their way to the Show for bespoke expert travel advice, show-only deals and tips for the bargains of 2019. Alderman Allan Ewart MBE, Vice-Chair of the Council’s Development Committee, speaking about the Show said: “We had 2,000 people visit our stand over the course of the three day show who were keen to hear about the tourism offering of the Lisburn Castlereagh area. The Council was keen to attend this show as it was the ideal opportunity to meet over 900 travel professionals from across Ireland and discuss why they should include Lisburn Castlereagh in their programmes. The Council area offers many key attractions including the Castle Gardens, Dundonald International Ice Bowl, Irish Linen Centre and Lisburn Museum, the ISLAND Arts Centre, the Lagan Valley LeisurePlex, Lagan Valley Regional Park, Moat Park and the charming villages of Hillsborough and Moira. There are a wide variety of activities available for everyone including cycling, horse riding, quad biking, fishing, motocross, walking and golf. Alan Greer from Hillsborough Castle said: “It was a great opportunity as Business Development Executive, Historic Royal Palaces - Hillsborough Castle to partner with the Council at Holiday World, Dublin. It was the first time we attended the event and working alongside the Council to promote the growing tourism offer within the Lisburn Castlereagh area was ideal.